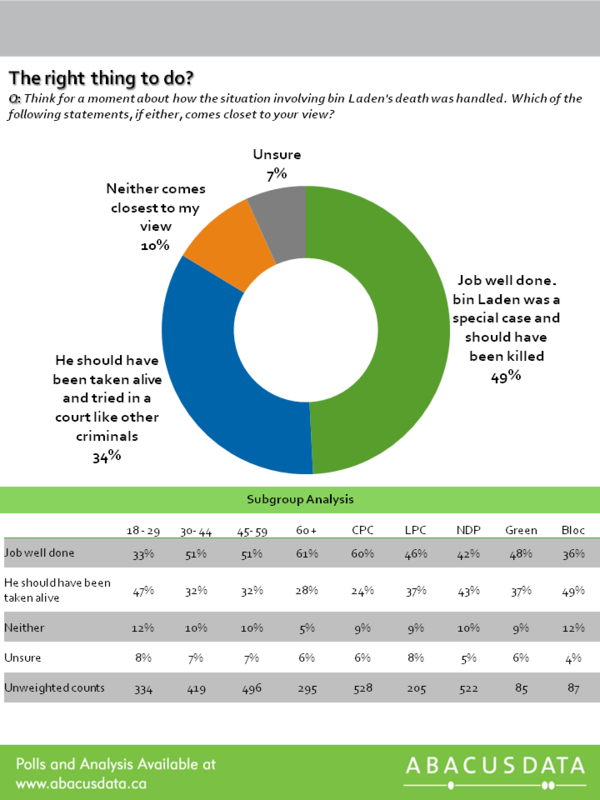 A new Sun Media-Abacus Data poll finds that an overwhelming majority of Canadians believe that Osama bin Laden got what he deserved while a majority believe that in general, terrorists should be treated like other criminals when it comes to justice and punishment. Eight in ten Canadians (82%) surveyed said yes, bin Laden got what he deserved while 18% said no he did not. When asked specifically about how bin Laden’s death was handled, 49% believed that it was a job well done since bin Laden was a special case and should have been killed. Another one in three respondents (34%) believed that he should have been taken alive and tried in a court like other criminals. Respondents were asked to agree or disagree with three statements regarding the mission to kill bin Laden. Less than one in two respondents (48%) disagreed that the United States overstepped its authority by sending a military team into a foreign country without that country’s knowledge. Thirty-five percent (35%) agreed. In contrast however, a strong majority of respondents (74%) agreed that the Pakistani government could not be trusted with information about the whereabouts of bin Laden while only 6% disagreed. Survey data indicates that when respondents are asked whether they agreed or disagreed that terrorists should be dealt with like other criminals, through legal process of arrest, trial, and judicially decided punishment, a small majority of Canadians agreed (54%). Another 32% either strongly or somewhat disagreed with the statement. The division was once again along generational and political lines. Between May 18 and 19, 2011 Abacus Data Inc. conducted an online survey among 1,544 randomly selected Canadian adults from an online panel of over 150,000 Canadians. The margin of error—which measures sampling variability—is comparable to +/- 2.5%, 19 times out of 20.